Miss Bridget Johnson. She gave the house to her sister Hanna who was married to David Donnegan. They passed it on to their son David. It was sold to Joseph and Julie Lynch who are the present owners and run a bed and breakfast called The First Cottage. James Griffin was married to a Long women from Ballyferriter. They had a large family. Timmy and Catherine remained in the house until they died. The house was willed to Mrs. Marie Goretti O’Sullivan of Cooleen. (James O’Connor) Michael O’Connor took care of his mother Elizabeth O’Connor Ashe who lived to be 100 years old. She died on Christmas Eve and was buried at Kildrum cemetery on Christmas Day around 1932. When Michael died the house passed on to his brother James of the Goree. James gave it to his son Michael O’Connor who was married to Joan Brennan. Michael and Joan had a family of 10 and their son John is the present owner. John Curran was married Ellen Donnellan. They had three sons Patrick, Jimmy and Edwin. When Edwin died without leaving a will a son Patrick claimed the property. The house has been sold twice the first time to an American actor called Wallace Sean (he had a voice part in the film Shrek) who owned the house for 16 years but never actually spend even one night in it. He then sold it to the present owners, David and Olwen Lynch (Dublin) and their children Katie, Adam and Michelle. James Quinn married Catherine Scanlon of Ventry. They had a large family some of whom emigrated to America. Johnny remained at home and married Hanna Sullivan of Ballymore – they did not have any children. When Johnny died he left the house to his wife who in turn left it to her nephew Ian Graham. The house was sold and purchased by Kathleen and Tom McCarthy. Two sisters Bridget Kavanagh and Mary Curran lived in the same house for many years. Bridget had two sons, Patty and Tommy Kavanagh. Mary had a large family. One son, Joe Curran inherited his uncle’s farm in Clahane, Ventry. Tommy, who was a post man, sold the house to Siobháin O’Connor who in turn sold it to the Harbour Master and his wife, Brian and Brenda Farrell, in 1993. Denis Slattery was married to Catherine Sullivan of Ballyhea. They had a large family, many emigrated to England. Willie stayed at home and married Lily Davenport. Their son Christie inherited the house and now lives their with his wife. Mike Murphy was married to Ellen Manning of Keelurra. They had four sons and one daughter (Mary). The house was purchased by the Donnegan family (who originally owned No. 119) who still live there. John Sheehy married Ellen O’Connor of Mullaugh, Cloghane, Castlegregory. They had a large family most of whom emigrated to America, John Joe stayed at home and married Abbie Long of Dunquin. Their son Tommy is a postman and lives in the house with his partner Mary Ann. James Kennedy married Nano Curran of Annascaul. Some of their children emigrated to America and others to England. Nonie stayed at home and did not marry. The house was passed to a daughter who resides in America. Patrick Lynch married Ellen O’Connor of Glens. They had nine children, two of whom emigrated to America. Padraig and Mary stayed in the house but Mary has since died and Padraig, who celebrated his 90th birthday recently, is now a resident in the local hospital. The house is currently vacant. Michael Murphy married Catherine Devane and moved into this house from Goat Street with their three children, Jack, Margaret (Peg) and Michael. All the children emigrated to England. Michael died about 1942 and Catherine died in England in 1960. The house was rented out for a number of years but remained in the ownership of Peg. 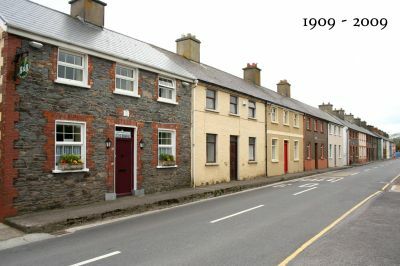 The Last Cottage is now a bed and breakfast run by Peg’s daughter Margaret Holderied and her daughter Lorna who returned to live in Dingle in 1981.